Subject to other terms and conditions set out herein, each Eligible Person will be eligible to win a maximum of one (1) Prize (as described below) throughout the Campaign Period. This contest is only available at Hard Rock Hotel Penang from 01 April – 20 September 2019. This contest is open to all nationalities, 18 years and older with a valid driver’s license who is legally able to register and insure a car in Malaysia. Entry is based on per stay basis, regardless of the number of nights booked. 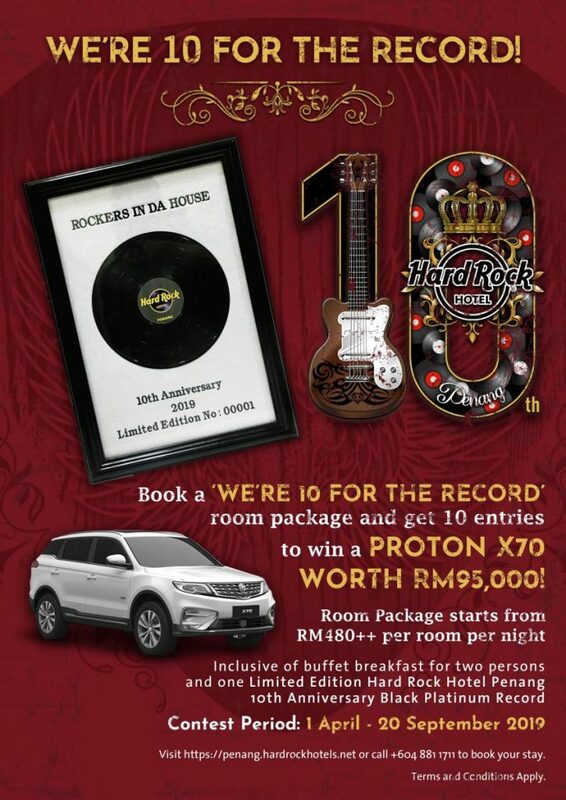 All room bookings have to be made directly on our hotel official website (penang.hardrockhotels.net) or with our Reservations team (email: reservations.penang@hardrockhotels.net or tel: +604 881 1711) in order to be eligible to participate in this contest. Bookings that are made through third-party intermediaries are not eligible to enter this contest. Cancelled bookings will not be eligible to enter the lucky draw contest. Employees of Hard Rock Hotel Penang and Hard Rock Cafe Penang and their immediate family members are excluded from all prize draws and contest participation. Accommodation prizes are valid for 6 months from the date of the announcement, subject to availability and blackout dates and must be redeemed within the validity period. Extension of validity is strictly not permitted. Any surcharge incurred from the room upgrade to another room category, extension of stay, booking of an additional room, personal purchase of Hard Rock merchandise and retail items will be borne solely by the winner. By entering this contest, the participants signify acceptance and agreement to all Terms & Conditions set by the management. No further appeal, inquiry and/or correspondence will be entertained. Winner must produce proof of identity (NRIC / Passport), a valid driver’s license and the printed prize notification email upon prize collection. Prizes are non-transferable and non-exchangeable for cash or other items. Value of the prizes may vary. Palmco Hotels Sdn Bhd reserves the right to replace any prizes with items of similar value without prior notice. The official raffle draw will be held on 21 September 2019. One (1) winner will be randomly selected by Hard Rock Hotel Penang from the pool of participants for each prize category after the closing date. Winner will be notified via email or telephone using the details provided at entry within (1) week of closing date. Following such notification, the winner will be required to respond to Hard Rock Hotel Penang via email as proof of receipt to confirm acceptance on the prizes. Winners that do not respond will be forfeited and the prize will be redrawn. Palmco Hotels Sdn Bhd will not be responsible for any missing of entries, misdirection of email, incorrect telephone number or any other technical problem resulting entrants not receiving the winning notification of this contest. Palmco Hotels Sdn Bhd accepts no responsibility for lost or stolen Hotel Stay Vouchers and strictly no extension on validity will be entertained. The winner shall be responsible for the registration costs which consist of Registration fees, Road Tax, Insurance, Inspection and Number plate fees. Palmco Hotels Sdn Bhd will not be responsible for transportation or delivery of any prizes. Prize must be collected by the winner from the appointed Proton Sales Centre. Prizes are given out on an “As Is” basis, and are non-transferable and non-exchangeable for cash or other goods, whether in part or in full. By entering the Contest or accepting the prizes, you agree that no claim relating to such losses or injuries shall be asserted against Palmco Hotels Sdn Bhd. All costs, fees and/or expenses incurred or to be incurred by the Winners in relation to the Campaign and/or to claim the Prize(s), which shall include but not limited to the costs for transportation, postage/courier, personal costs and/or any other costs, are the sole responsibility of the Winners. The title in the Prizes and any risk of loss or damage to the Prizes will pass to the Winners upon delivery of the Prizes to such Winners. Palmco Hotels Sdn Bhd shall not be liable for or obliged to recognize or replace any defective, lost, damaged or stolen Prizes where such defect, loss or damage in respect of the Prize is not due to the fault and/or negligence of Palmco Hotels Sdn Bhd.